Mira Mesa, Sorrento Mesa, Sorrento Valley – where am I??? There has been considerable controversy over the past couple of years about which names should be applied to various parts of the Mira Mesa Community. This page is intended to give a factual explanation of the origin of the names and where each applies. If anyone finds an error on this page, please send it to webmaster@miramesatowncouncil.org. The root of the problem is that several names apply to the same location. Different names are appropriate in different contexts. All of Mira Mesa and the surrounding areas are part of the State of California, County of San Diego and City of San Diego and it is appropriate to call any location in the area by those names. In addition, there are a variety of subdivisions that apply at any specific location. 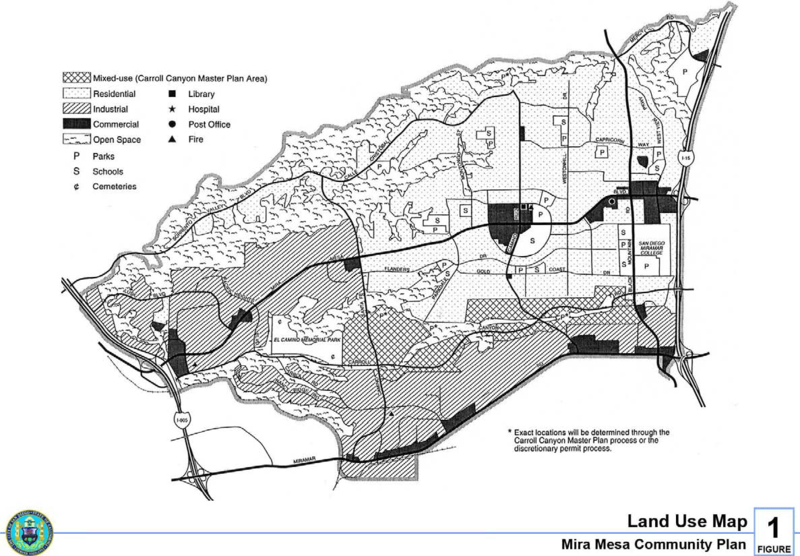 The Mira Mesa Community is defined by the Mira Mesa Community Plan, and it identifies the land uses shown in the figure below. This is the most fundamental region after state, city and county, because the boundaries and land uses are set by the San Diego City Council and an action of the City Council is required to make any changes. The current plan was approved in 1992, with very minor boundary adjustments from the previous plan that was approved in 1981. 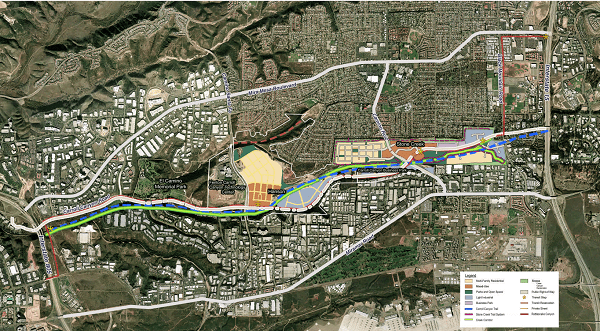 It includes the area between I-805 and I-15 from Los Penasquitos Canyon Preserve to MCAS Miramar, following the railroad tracks in the southwest corner of the community. This is the definition of Mira Mesa used by the Mira Mesa Town Council, Mira Mesa Community Planning Group, Mira Mesa Recreation Council and most other community and City-sponsored organizations. There are currently no residential subareas in the community plan. The only other large identified area in the community plan is the Carroll Canyon Master Plan area, which is shown below. This area includes the two large gravel mining operations of Vulcan to the east and Hanson to the west, as well as two now-developed business parks and the El Camino Memorial Park cemetery. Shown on the figure are the current plans for redevelopment of the gravel mining operations after mining is concluded. The next category of names, which are unfortunately inconsistent with both the naming and boundaries in the Community Plan are the Police Department Neighborhoods, which are shown below. The Police Department neighborhoods were intended to provide more understandable names for police beat numbers. There are 3 police beats in the Mira Mesa Community: 242, which is called the Mira Mesa neighborhood; 931, the Sorrento Valley neighborhood; and 243, the Miramar neighborhood. The names and boundaries are defined by the Police Department to suit their needs, and they can and do change them as their needs change. 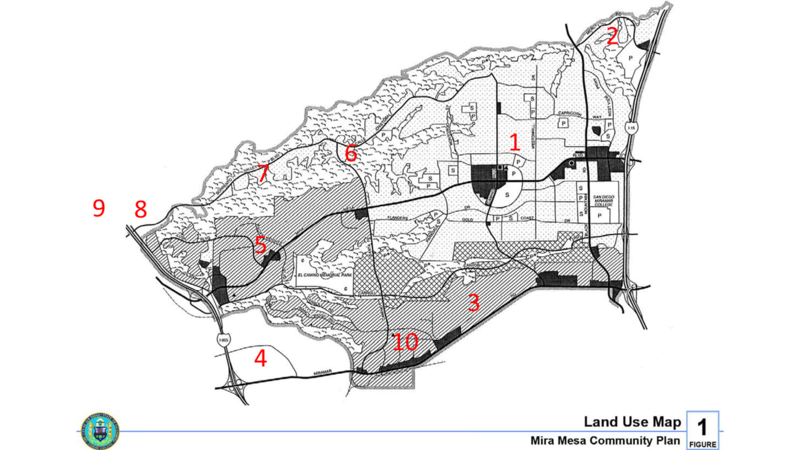 The Mira Mesa PD neighborhood is contained within the Mira Mesa Community Plan, and they have the same northern and eastern boundaries, however the Sorrento Valley PD neighborhood extends west and south of the community into the University and Torrey Pines communities, and the Miramar PD neighborhood extends south to include MCAS Miramar. The police department uses these neighborhood names in their police reports and so you will often here these names rather than the Community Plan names used in news reports. Also, the residential area along Lopez Ridge west of Camino Santa Fe was marketed under the Sorrento Valley name, and so many residents in that area identify with the Sorrento Valley name more than the Mira Mesa name. Adding to the confusion, there is a Sorrento Valley business area identified in the Torrey Pines Community Plan. This area along Sorrento Valley Road and Sorrento Valley Blvd. west of Lopez Ridge has existed under the Sorrento Valley name for at least 50 years, but the northern half of it is outside the Sorrento Valley PD neighborhood and in the Torrey Preserve PD neighborhood. The figure below shows the overlap between the Sorrento Valley PD neighborhood and the boundaries identified in the three community plans that overlap it. There are many other boundaries as well, again with little consistency. The figure below shows zip codes. Zip codes 92126 and 92121 bear some resemblance to the Mira Mesa and Sorrento Valley PD neighborhoods, respectively, but are far from identical. The area along Mercy Road in the northeastern corner of Mira Mesa has a 92129 zip code, a zip code that covers most of Rancho Penasquitos. The area east of Camino Santa Fe and just south of Calle Cristobal is in the 92126 zip code and the Sorrento Valley PD neighborhood. And there are more boundaries yet. 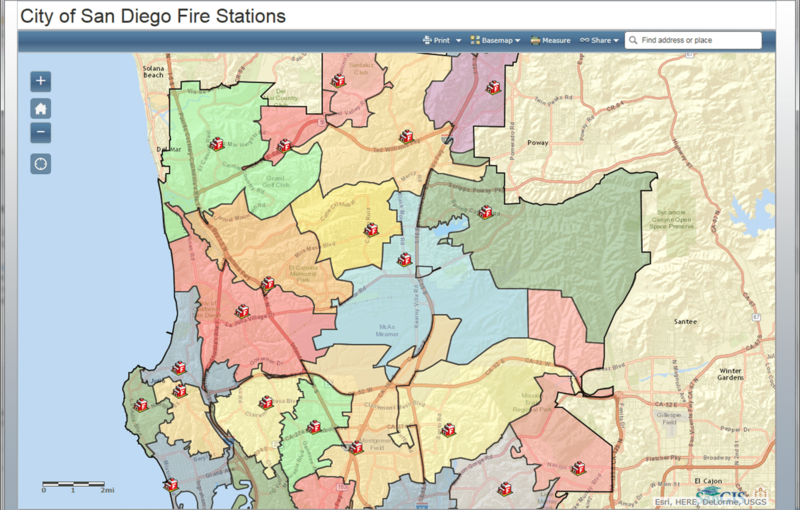 Here are the boundaries used by the fire department, which are associated with fire stations and are inconsistent with all of the other boundaries. The NextDoor.com neighborhoods, which were set up by the police department and have approximately equal populations in each neighborhood provide another set of boundaries on a smaller scale. In addition to these names, several of the residential subdivisions have monument signs identifying them, notably Pacific Ridge, on Lopez Ridge west of Camino Santa Fe, and Westview, east of Black Mountain Road along Westview Parkway. 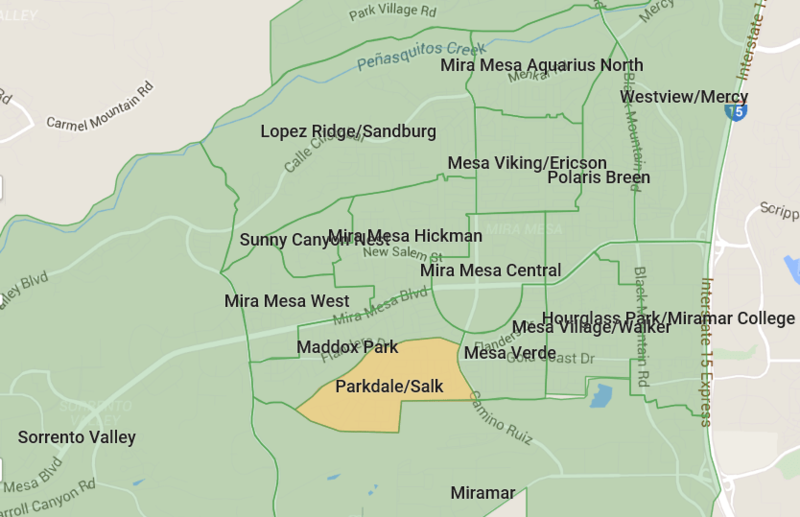 All of the residential areas in Mira Mesa were part of named subdivisions, but most of those names are no longer used. The area along Black Mountain Road just north of Miramar Road that contains a number of Indian restaurants and stores and a Hindu temple, calls itself “Little India“. 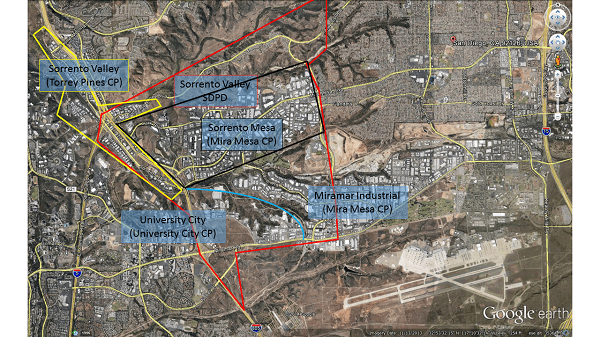 To summarize, every location within or near the Mira Mesa Community has multiple names associated with it. It can be very confusing, but there is a specific set of names associated with every point. The map below shows 10 locations, each with a different combination of Community Plan, Community Plan subarea, Police Department Neighborhood and zip code. It is left as an exercise to the reader to identify them based on the information above.